combine eggs, and cream and mix. let sit until it’s almost room temp (this is KEY). i’ll explain later. cook the panchetta and cut into small dime-size bits. set chopped panchetta aside. cook spaghetti until al dente, you DO know to season the water with 2-3 pinches kosher salt, and splash of olive oil….right? when the spaghetti is done drain it and place it into a serving bowl. pour in the tepid egg/cream mix and mix the spaghetti with 2 forks quickly. now…..you want to cook the egg with the hot pasta so that’s why you want the mixture room-temp. once it’s thickened and creamy, plate and top with parmesan cheese, chopped panchetta, and fresh-cut black pepper. bon apitto. I think it’s worth mentioning that the black pepper is an essential component of this dish. 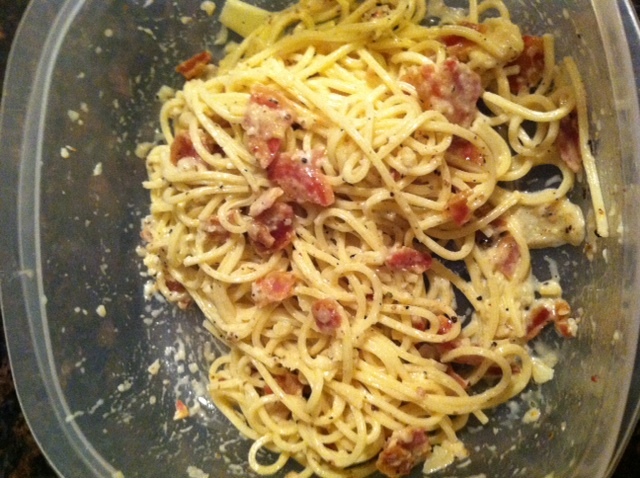 It’s called “Carbonara” because it’s meant to look like coal dust on pasta. Thank you Dear. Carbonara means coal and it was made for a coal mining society. Well thank you. Welcome to the Danny show.